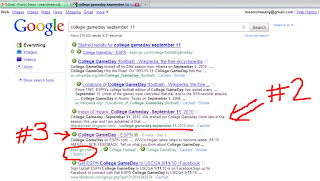 Well, we are still NOT showing for Teh Google Search, "College Gameday." It is taking a little more time this year and that damnable "Instant Search" is NOT helping. Anyhoo, the Four Letter Moron College Gameday crew shall be in Bammeroidville for the Tuscaloosa Bammeroids v. Joe Pa. I predict the final score to be 300-6, Bammer. Take that to the betting cage, baby. Please do not forget to purchase your SEC College Gameday jersey. MoM's jersey store is OPEN. Here's one for your Doggeroid Bammeroid. I think you're a bit optimistic about Joe Pa scoring 6. But, it's early in the season, so it could happen. I'm saying 'Bama 25 (?? ?...yeah, 25), the other guys 3. As to MoM showing up so low in the search, it's probably because RPM had much more participation in the comments in previous quests for numero uno. I mean, you can't count on CJ, CL, or nobody for commentories to get you up above the Wickedpedia deal anymore. 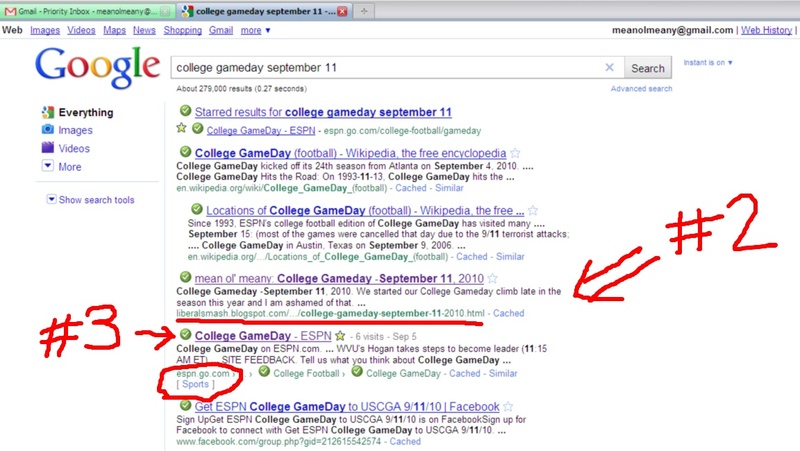 But, I will always shout COLLEGE GAMEDAY when prompted. I am a follower that does what he is told. MoM will once again be the champeen. But, sometimes it takes a while for everything to gel. I'm thinkin' that by week four, we'll be back in our rightful spot.